The latest Christmas tradition has seen elves taking over houses throughout the country. The story goes that Santa leaves one of his elves with a family to watch over the children and make sure they are behaving, with the theory that naughty children will get nothing for Christmas. The twist seems to be that the Elf himself gets up to mischief every night while the children sleep, much to the amusement of the children in the morning. Unfortunately, there was no way my autistic children would cope with this. For one, my daughter would be traumatised by the thought of anyone watching her. Second, her non-verbal brother with severe autism is too often seen as “naughty” by others, and there was no way I wanted her thinking he would be getting nothing for Christmas. Lastly, neither of my children need any extra ideas for silly things to get up to, as they are never short of ideas themselves. 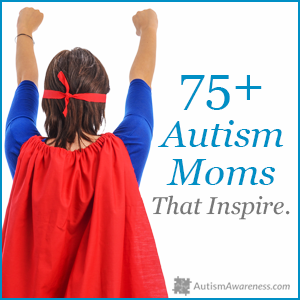 BUT my autistic daughter was so desperate to be part of this craze! I hated that she felt left out, as she experiences this exclusion often enough as it is. Therefore, I decided to use the latest trend to help her instead. 1. Elf taught her a simple way to make a new friend. 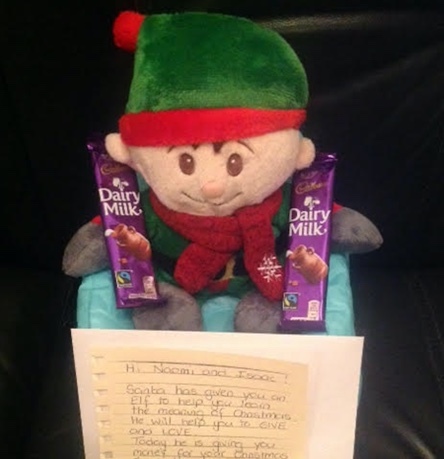 The very first task Elf gave Naomi was to share a snack at school with someone. My daughter has huge anxiety and is selectively mute, but giving a little bar of chocolate to someone enabled her to be silently social. This helped her realise that reaching out in friendship to someone else is not as scary as she imagined it to be. 2. Elf helped her understand what other people may wish for. My daughter, like many children (and adults) with autism, struggles to imagine what other people are thinking and what other people may enjoy. One day, our kindness Elf gifted her a small sum of money and said she could be a Secret Santa to seven people. I took her to a pound shop (same as a dollar store in the States) to buy seven items. Out of all the things the shop sold, she was most excited to find toilet cleaner! I helped explain why, although a practical item to purchase, this may not be quite what any of her chosen people would like to unwrap on Christmas morning. We had an ideal opportunity to think about what other people like, which helped her to gradually realise that we all think differently. 3. Elf got her out in the community more. One day, Elf suggested we take food to our local food bank. This enthralled my daughter, who found it difficult to imagine someone not having food in their cupboard. As a result, she became much more socially aware. She struggles to leave the house for any activities or clubs, so Elf has helped her overcome this by giving her simple and achievable tasks to get her out in the community more. This will benefit more than just us. 4. Elf boosted her self-esteem. 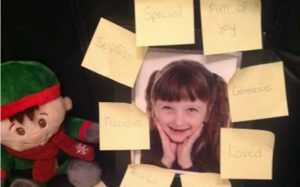 One morning, Naomi woke up to find that Elf had covered a photo of her in Post-It notes! Each note was a word of affirmation and kindness about her because Elf wanted her to share words of kindness with others. She took all those notes and sat them right by her bed. I know she reads them before falling asleep. If they make a difference to her self-esteem, then I don’t care if she thinks the words came from a stuffed elf. There are days when we could all benefit from more kind words directed at us. 5. Elf helped her feel included. Every morning at school this month, at least one child has come up to Naomi and asked her what her elf has done that day. Although she struggles to tell them, she smiles because somebody has come up and spoken to her rather than simply ignoring her. For once, she is not the “different” child, but rather “one of them,” and this is worth every effort it has taken for me to think of things for her elf to do and say. I haven’t finished with Elf yet. 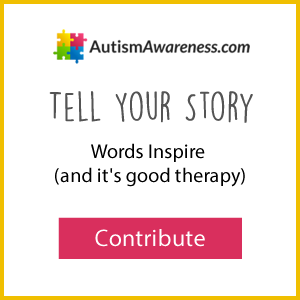 I have plans for him to bring some autism awareness somehow, and more ideas that could help my daughter during a month she usually finds very stressful. Her Elf on the Shelf is bringing consistency in a month of chaos, fun in a month of stress, and love in a month so typically consumed by consumerism. When I started the year, one of my resolutions was to help my child any way that I could. I never thought for a moment that goal would involve a cuddly elf, but it’s working out just fine. Miriam lives in Scotland with her husband and twins. Trained as a teacher, she started blogging in 2013 when her son was diagnosed with the genetic condition nf1. Both twins have autism and Miriam describes her life as "sometimes challenging, mostly hectic, but always full of love."